This is something I’ve not seen before — though that doesn’t mean it didn’t happen before. It was probably a familiar sight every now and then before the Foss barrier was erected in the late 1980s. Flood water on Stonebow and in the Hungate area, on the afternoon of 27 December 2015. Following on from the earlier walk by the Ouse and through the city centre, we’re now near the Foss, York’s second river. The failure of the Foss barrier is the main story in this particular flood of late December 2015, as it has caused the Foss to flood in a way it hasn’t done for a long time. 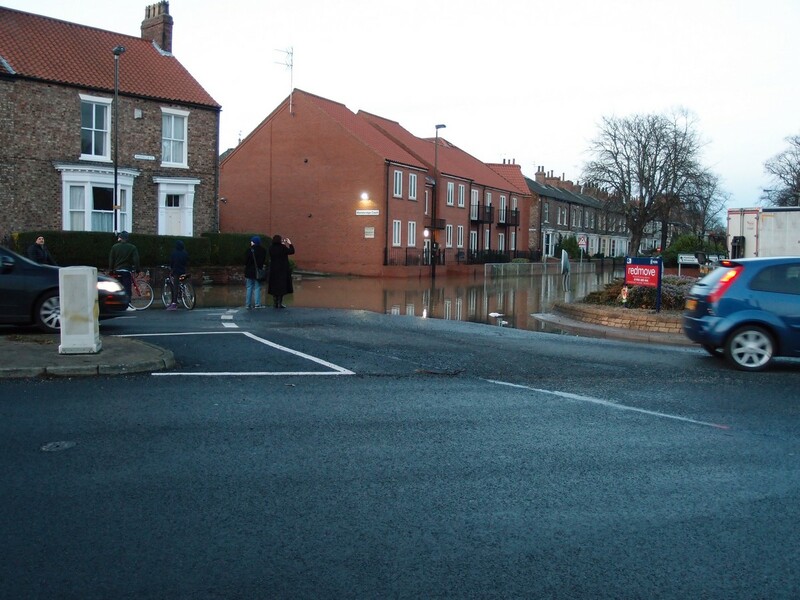 There’s also been flooding in the nearby Walmgate/Fossgate area, all very unexpected and sudden. There are many photos available online. I don’t have any, but thoughts are with the people of that area and others who have suffered in these floods and who will have the filthy mess to clear up from their houses and businesses when the water recedes. Turning back away from town, along Peasholme Green. Where, again, the road was flooded near the Foss, on the approach to Layerthorpe Bridge. To get out of the city on foot we had to backtrack up Aldwark onto Goodramgate, and leave through Monk Bar. 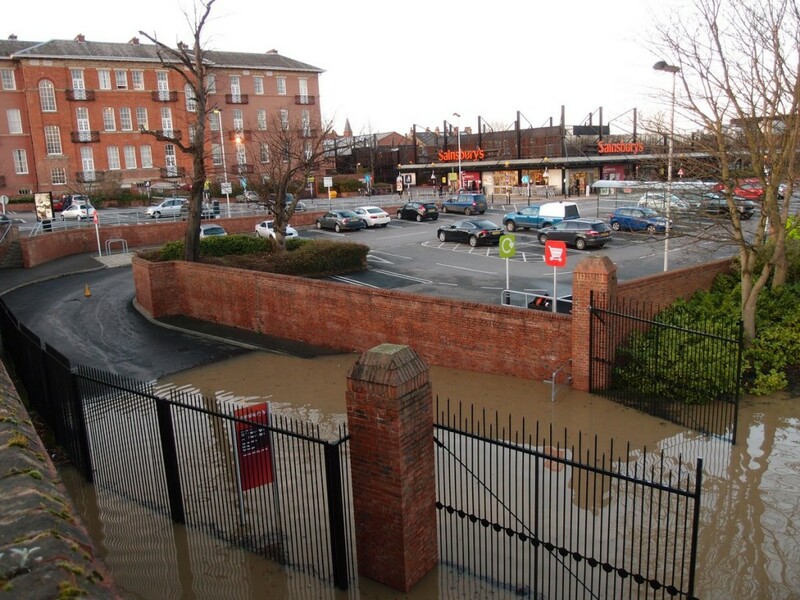 Monkgate and St Maurice’s Road weren’t flooded, and neither was the Sainsbury’s store and its higher level car park. 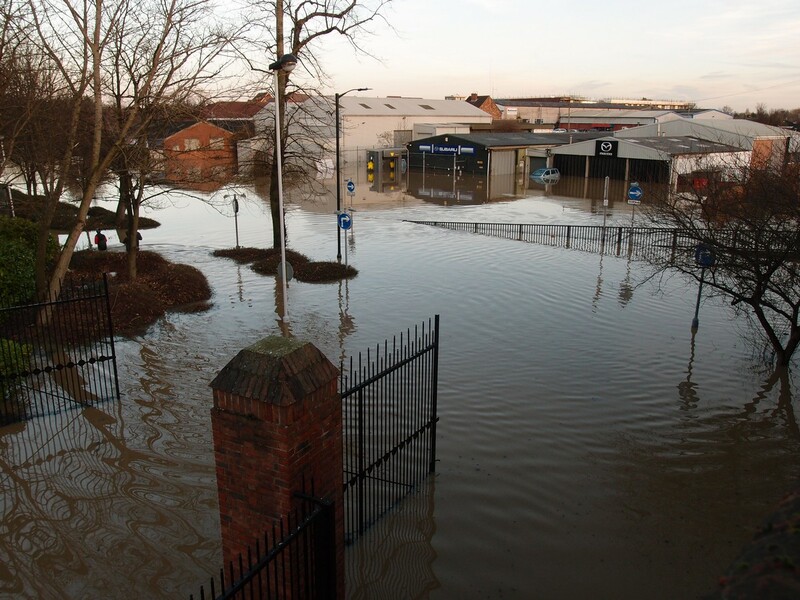 The flooding hasn’t submerged the entire city, though some media reports may have given that impression. As in many other places in the city, I was one of many people standing taking photographs at the edges of the flooded areas. From this vantage point the picture became clearer on the extent of the flooding from the Foss in the Layerthorpe and Foss Islands area. 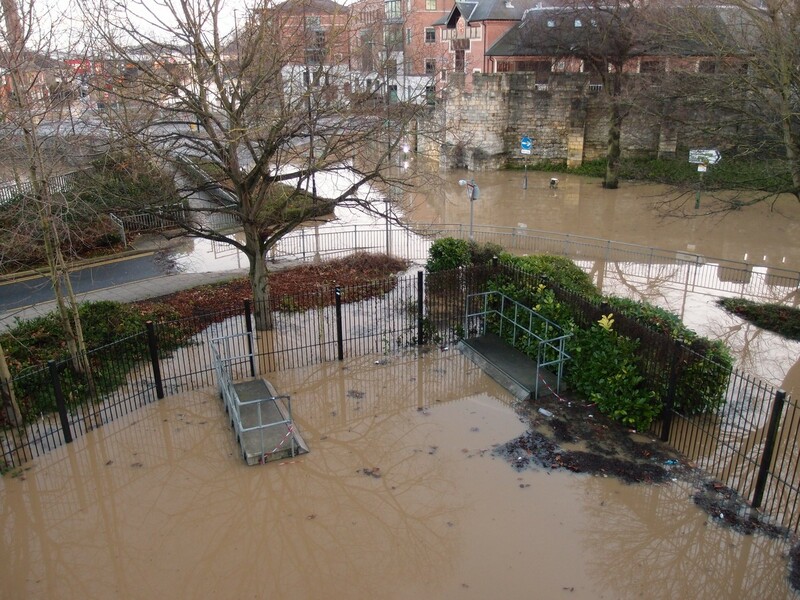 The Foss is normally in a narrow channel in the middle of this view below, looking across to the flooded car showroom on Layerthorpe (where the John Bull pub used to be). The name ‘Foss Islands’ should give us a clue that this part of town has always been rather watery. Once the ‘King’s Fish-Pond’ or ‘King’s Fish Pool’. Its water has been controlled and channeled in recent centuries, but now spills out, reclaiming the space it once knew, creeping over the tarmac of the roads. Anyone walking on the walls and ending up at Layerthorpe Postern would have had to turn round and go back the same way, by the looks of things. The lane at the back of the Sainsbury’s store takes us to Foss Bank. 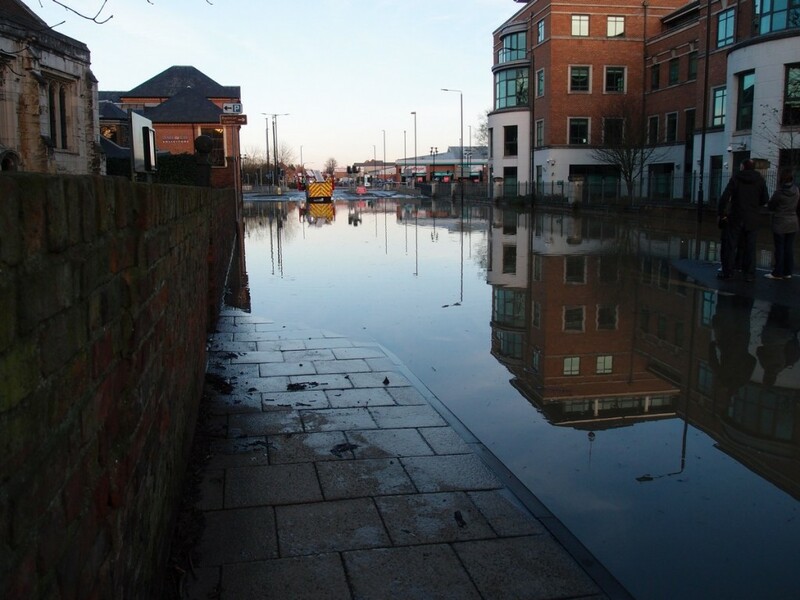 Here part of the road is also flooded, alongside the Foss. The river is normally to the left of those railings, and well below them, so you have to look over to see it. A different picture on Sunday 27 December. Though not unknown — it looked similar in the floods of 1982 (with a gasometer in the background, back then). Turning back, heading home, there were crowds gathered on Monk Bridge, over the Foss at the end of Heworth Green, looking up Huntington Road where some of the worst local flooding had occurred in houses backing on to the Foss. 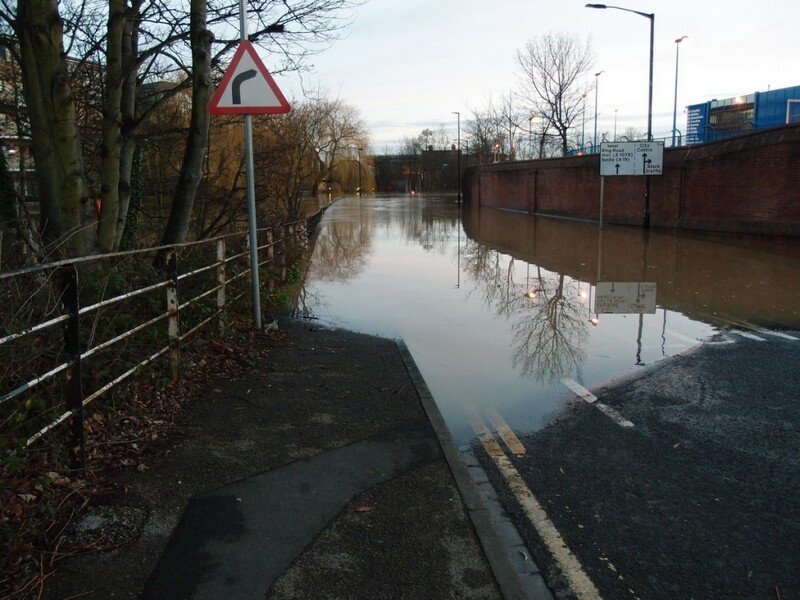 The photo below shows the floodwater at the roundabout at the junctions of Monkgate, Huntington Road, Heworth Green and Foss Bank. We’re looking from Monkgate towards Huntington Road, with the roundabout on the right. I’m assembling this page the day after these photos were taken. 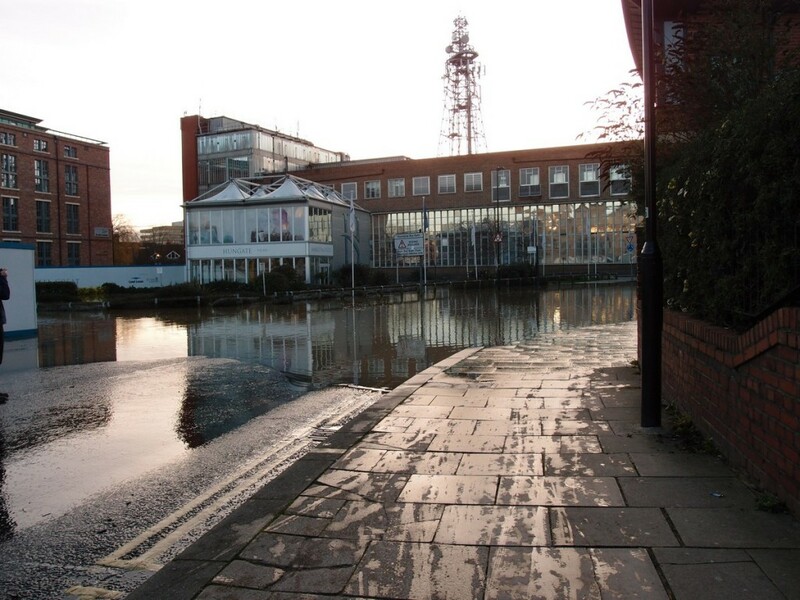 Early this morning we heard from the authorities that the river levels had stabilised. The floodwaters will recede and the media — and we floodwatchers and amateur photographers — will disperse with them, leaving behind us, as always, many people having to clean up the mess the rivers left behind.